College football has a longer history and a more hallowed tradition than the National Football League, and that makes it difficult to rank the best. However, these ten legendary teams from both the classic and the modern eras make a convincing case. After winning World War II, the Army won college football. Although you could argue that the 1943 Notre Dame team should get the number one spot, the 1945 Army football team is regarded by multiple sports analysts (including this thorough analysis by SB Nation) as the greatest college football team of all time. Heisman Trophy winner Felix Blanchard lead the team to a 9-0 season and their 48-0 win over Notre Dame is the stuff of legends. As mentioned in the link above, Notre Dame's 1943 Fighting Irish are regarded as one of the all-time greatest, if not the best, college football team to step on a field. They managed to pull off a 9-1 record in what sports historians regard as the most difficult schedule of opponents in college football history. Their quarterback Angelo Bertelli won the Heisman Trophy that year despite leaving part way through the season to fight in the war. The 2001 Miami Hurricanes was named as one of the top squads on ESPN's list of the greatest college football teams of all time. Sports fans will never forget Ken Dorsey and Clinton Portis, who led their team to a 12-0 season and won each game by an average of 34 points each game. A writer from SEC Sports Fan makes a persuasive case that the 1995 Nebraska Cornhuskers should be considered the number one college football team of all-time. While their analysis is biased, there is no doubt this team was one of the best. They won almost every game by multiple touchdowns, and their legendary coach Tom Osborne and his squad crushed the undefeated Florida in the 1995 season's Fiesta Bowl in one of the most impressive wins in Bowl history. 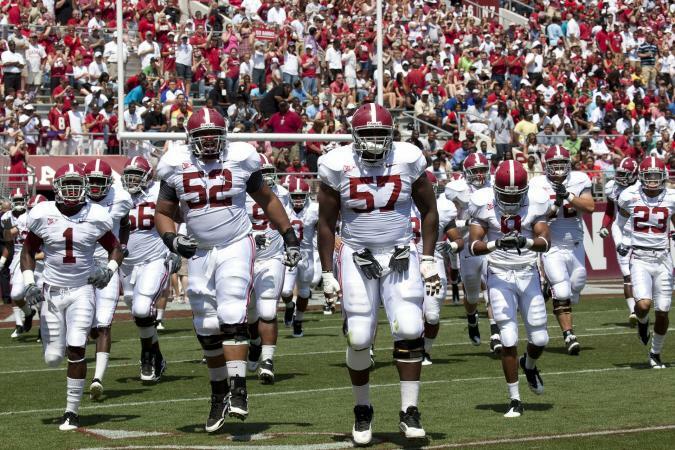 Often ranked as one of the top college football teams in the modern era by sports analysts, The Tide, led by Nick Saban, was unstoppable in 2011. They put up numbers for the history books, including such memorable feats as not allowing their opponent (LSU) to score in the BCS National Championship Game and having four players named as first-team All-Americans by the Associated Press. They allowed only 8.2 points per game on average throughout the season. Sports On Earth put the 1972 USC Trojans easily in the top ten for the best college football team. The Trojans' stats for the 12-0 season included a 42-17 victory over the Ohio State Buckeyes in the Rose Bowl. By the end of that remarkable season, USC was ranked number one on every ballot cast by coaches and the media. Notre Dame is one of the best college football programs of all time, and according to Athlon's analysis of the Notre Dame program, the 1988 Fighting Irish was their best team (or perhaps second best, if you believe their 1943 team was the best). One of the best coaches of all time, Lou Holtz, led the team to a National Championship while becoming the only undefeated 12-0 Notre Dame in its history. He did this all while beating the number one ranked Miami, number two USC and number three West Virginia teams. Ranked the number three best college football team of the modern era by Bleacher Report, the 2005 Texas Longhorns made the Lone Star State proud in a big way. (After all, Texas does everything in a big way.) They had an undefeated 13-0 record and achieved a then-record for scoring by amassing 652 total points. Their quarterback, future NFL star Vince Young, was also the first college football player to rush for 1,000 years and throw 2,500 in the same season. The Cornhuskers come in at the number one spot on ESPN Sport's list of best college teams ever. Although some might argue that ranking, it is easy to see why ESPN would make that call. The 1971 Cornhuskers averaged 39 points a game, were undefeated and won 35-31 against the formidable Oklahoma on Thanksgiving Day. To this day, many sports fans call this "The Game of the Century." Does College Football Make Money?